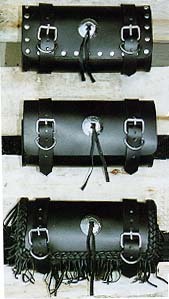 Tool pouches to match our saddle bags. Choose your favorite trim package from plain to fancy. Style number 1501.00 This black tool pouch features silver tone concho, and "D" ring keepers with stud trim. Style number 1500.00 This tool bag features silver tone concho and "D" ring keepers on the fastening belts. Style number 1502.00 This black tool pouch features a braided leather border with fringe trim. "D" ring keepers and silver tone concho. Sizes: 9 1/2 " x 5" x 3"